Even as we uncover obscure places, people and facts around New Jersey, I keep a short list of more widely-known destinations in the back of my head for further exploration if we happen to be in the area. I've seen a good number of the old reliables that the guidebooks and other media have featured, but there are a few I haven't gotten to for one reason or another. The Carranza Memorial is one of them. 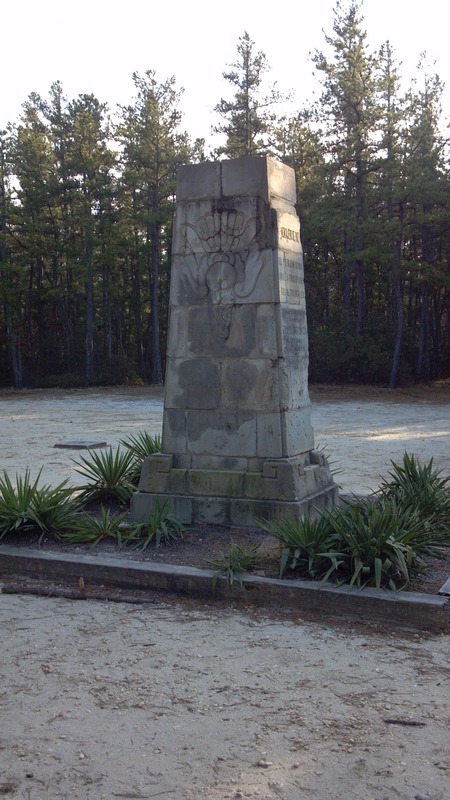 Deep in the Pinelands, it marks the spot where Mexican Air Force Captain Emilio Carranza's plane crashed on July 12, 1928. Dubbed the Charles Lindbergh of Mexico, the aviator was concluding a goodwill tour in the United States with an attempt to fly from Long Island to Mexico City. If successful, he would have achieved the second longest non-stop airplane flight to date, after Lindbergh's own New York to Paris achievement the year before. Unfortunately, it was not to be. The dashing young pioneer ran into a thunderstorm over southern New Jersey, and his plane plummeted to the ground in dense woods outside Tabernacle. Carranza may have crashed in an obscure area, but he was not to be forgotten. A few years later, the crash location was marked by a monument erected by the Mexican government and funded by contributions from the country's school children. Constructed of brick stones mined from every state in Mexico, the moderately-sized obelisk is marked with an Aztec eagle and an arrow to represent the flight, plus inscriptions in Spanish and English. Sounds pretty cool, right? And with a bird on the monument, it's right up Ivan's alley, so why the delay for us? Fact is, we hadn't made it to the general Carranza-politan area because the Pinelands is seldom birded. Yeah, it's an enormous, reasonably pristine stretch of forest, punctuated only occasionally by a town or a county road, but the habitat is much less varied than what you find in other wooded parts of the state. Just about everywhere you look, you see sandy soil and slim conifers, maybe with an oak thrown in for good measure. I could go into a dissertation as to why this is, but the short answer has to do with the porousness of the soil and, to some extent, the burn cycles that favor the existing flora. Bottom line, less variety leads to fewer species of birds. And, of course, birders go where they'll find many species or a sought-after specialty. In any case, it's been on my 'go to' list for years, and I knew it was accessible because Mexican consular officials and the local American Legion hold a ceremony there every year. "How?" was the question. 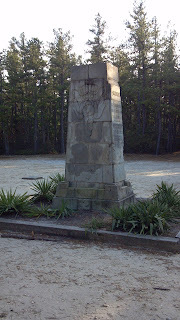 Every time I noticed the memorial on a map, deep within Wharton State Forest, no decent roads seemed to lead to it. Certainly there had to be a path or trail, but I'd seen enough sand roads off thoroughfares in the larger Pinelands to think twice about taking them. Getting stranded miles from help didn't sound like much fun. Our recent Brig jaunt brought us near the Pinelands, so I suggested we might make a lengthy detour and attempt to find Carranza. After all, we still hadn't seen our desired cone seed-eating crossbills and evening grosbeaks, we'd be surrounded by conifers, and ... eh, who was I kidding? We were going to scour vast acres of pine trees on the futile search for birds? Let's just dive in and go. We plotted a general route on county roads from the refuge and were on our way. Thing was, we were basically aiming to get to our desired location from Wharton's southern boundary, when the best route was probably from the north. If I was reading Ivan's ancient New Jersey map properly, we were bound to run into some sandy two-track roads once we were in the forest proper, but they appeared to be unmarked and confusing. Maybe it made some sense to stop and grab a map at Batsto Village, on the southern edge of the forest. Finding that was easy, given all of the directional signs on the road. Now, the historic community of Batsto deserves an entry all to itself, and we'll definitely get there again for a closer look, but it was too late in the day us to do it justice on this trip. The information desk folks were very friendly and advised us to head north on a county road lining the eastern edge of Wharton, then make a left onto Speedwell-Friendship Road, which would bring us to Carranza Road and the memorial, directly across from the Batona camp. The paved road would turn to gravel, but at least we'd avoid the rutted sand/dirt roads. We zoomed east and then north on the prescribed county roads, past cranberry bogs I recognized from my past visit to Chatsworth (you mean I'd been that close and didn't realize it???). Now fully harvested, the bogs were dry, the plants a dark red color that made them look berry stained. We went on a bit longer until we arrived at our left turn, Speedwell-Friendship Road. Now we were truly in the Pines. Thin, scraggled trees lined both sides of the road, many so close together it appeared impossible to hike between them. "A deer could never get a rack through there," I observed as Ivan directed the car down the straight road. About three miles in, the road track turned to gravel -- not as secure as macadam but definitely preferable to sand. Overall, the surface quality was decent, with few potholes or other potential perils. Still, I'd avoid driving it at night; the desolation and lack of streetlights would create quite a challenge, particularly for those who fear old JD. There it was! Located in a large clearing, the obelisk is bordered by several hardy plants that reminded me somewhat of agave or aloe vera. The park was bigger than I thought it would be; somehow I'd imagined the memorial was just planted among the pines. Visitors can learn Carranza's story from a bilingual wayside marker, and two holes in the ground appear to be there to receive American and Mexican flags for the annual ceremony. We were starting to lose sunlight, and we wanted to stop in Chatsworth, so we were on our way after paying our respects to Carranza. As luck would have it, the road turned from gravel to macadam maybe a mile or less north of the memorial. Keep it in mind if you want to make a visit there: the trip is quicker and smoother going south from Tabernacle, but if you want more of a Pinelands experience, come in from the south. As I've been thinking about Carranza, I'm struck by a couple of things related to the popular comparison of him to Lindbergh. It's interesting to think that just a few years after Carranza's plane, reportedly an exact replica of The Spirit of St. Louis, crashed in the wilderness of the Pinelands, Lindbergh moved his family to a remote location in New Jersey's Sourlands, looking for a respite from unrelenting public attention. Lindbergh was forced to leave the country to find peace after the kidnap of his first child. Carranza is a footnote in world aviation history but is remembered by family, country and a small but dedicated group of New Jerseyans who return to his death site every year. Lindbergh's Sourlands estate is maybe a little less remote, but still obscure and hard to find unless you've found a local who can tell you where it is. That's a Hidden New Jersey jaunt for another time. We sometimes have to be a bit strategic when we plan a Hidden New Jersey history field trip involving multiple locations. Sites seem to all be staffed for the same limited hours, so we need to determine if an before- or after-hours visit would be just as productive. And, of course, we have to be a bit flexible to account for the serendipitous stop at a must-see we find along the way. I ran into this challenge a few weeks ago during Union County's Four Centuries weekend, when I had about four hours to make meaningful visits to as many sites as possible. Hillside's Evergreen Cemetery went on the 'later' list, so when I was in the neighborhood the other day, I stopped in to check it out. Listed on the New Jersey and National Registers of Historic Places, Evergreen opened in 1853 as the state's first non-profit, non-sectarian cemetery. It's become the final resting places for six Members of Congress (and a non-voting delegate from pre-statehood Alaska), famous writers, a substantial Roma (Gypsy) population, and local luminaries including Newark's first black school principal and the first Jewish mayor of Elizabeth. I had some idea there were some must-visits, but I didn't know where they were, or, for that matter, how expansive the cemetery was. The cemetery's grand gates welcome visitors from the center of a block on North Broad Street, but I snuck in a still-nicely-marked corner entrance. Almost immediately I saw one of the grand contemporary memorials that have made Evergreen a favored stop for current-day graveyard art enthusiasts. Out of place among the older sandstone and gray granite markers, many of them consist of black stone slabs well over five feet tall joined by a common lintel, and usually engraved in gold lettering. The most interesting thing about them, in my opinion, is that some have been placed in the cemetery's older section, which was designed in the Victorian style: park-like, with graves placed in harmony with the landscape. This motif was common in the mid 1800s, when graveyards were popular places to picnic and enjoy a pleasant Sunday afternoon with friends. Unfortunately, Hurricane Sandy made her mark on some of what makes Evergreen such a pastoral spot. 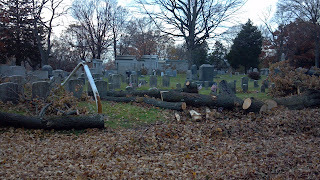 It's said that many of the cemetery's trees are over 300 years old, and as I made my way through, I saw that several limbs were down, some trees even toppled, taking with them more than a few monuments. 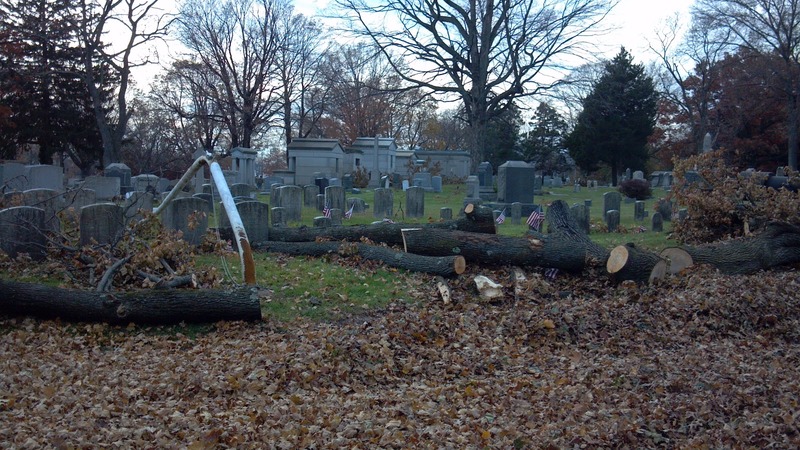 Workers were busily collecting leaves and branches, but three weeks after the storm, they still have a lot of work to do. Not far into my ramblings, I came to a section with several familiar-looking white grave markers placed in uniform rows. If I had any question on what I'd stumbled onto, it was answered by the pair of 100 pound cannons flanking the plot. I'd found the cemetery's Civil War section, set aside in 1862 for free burials of dozens of casualties and veterans of the War Between the States. Some of the stones were visible and easily read, while others were obscured by fallen tree limbs. A nearby flagpole was bent over a few feet above its base, perhaps by the branch that sat nearby, already sawed into sections to be carted away. I spent a good few minutes resetting many of the American flags that had fallen to the ground after presumably having been placed on the graves for Veterans Day. Just by chance, I noticed two gravestones marked "US Col. Inf" or "USCI," meaning "United States Colored Infantry," the segregated troops that fought in the Civil War. 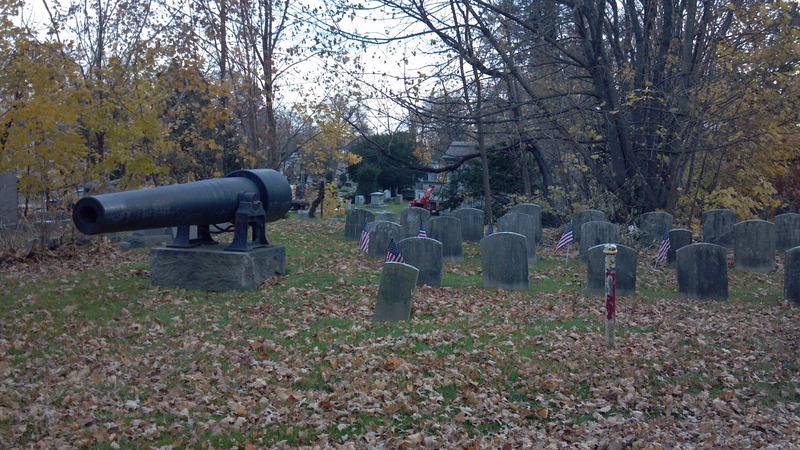 Had I stumbled upon a large contingent of African American casualties' final resting places? I couldn't really tell -- while many of the markers didn't indicate service in the segregated service, other stones were totally inaccessible. A little research at home uncovered a possibility. More than 75 black Civil War veterans are buried at Evergreen, some with stones that note their service in the segregated ranks. Some historians believe that others actually served in Union County regiments that had been assumed to be all white. 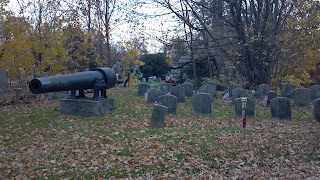 Regardless, those buried here seem to have been honored well, considering the presence of the cannons, which I learned were procured by Elizabeth Mayor Dr. William Mack on Memorial Day, 1900. Other Civil War veterans are interred at Evergreen within their own family plots or mausoleums, including Brevet Brigadier General James Vote Bomford and Medal of Honor recipient Captain William Brant, Jr. Their graves, however, would have to wait another day for discovery. There's way too much about Evergreen to limit it to a short visit, so I'll be back, next time with Ivan in tow. This weekend's search for winter finches brought us into Passaic County's more wooded spots, particularly the Pequannock watershed. Crossbills and evening grosbeaks look to coniferous trees for food, so the evergreen groves surrounding the Newark reservoir seemed the logical place for us to get a good look. The plan was to stop, look and listen: stop at a given stand of appropriate trees, walk a little along the road and into the forest, look for activity, and listen for the calls of our target species. Our luck wasn't really holding as we seemed to be hitting our second consecutive weekend of dry birding, but we couldn't complain about the terrain or the scenery. Walking about five feet into a grove of towering pines, I was overwhelmed by the sheer number of trees as much as I was by their size. I've been to redwood forests in Northern California, and these weren't the same, yet they were more impressive in their own way. Because they're smaller in girth, I guess, they can grow more densely packed together, leaving the visitor with a feeling of walking among the legs of a crowd of very tall people. We heard little to no bird chatter, only the slight creaking of an older tree whose top was swaying in the breeze above. Underbrush was sparse, but several young Charlie Brown-type pines stood knee or waist high, waiting for their time in the sun. Still, no birds of note. Maybe the finches just weren't buying what these evergreens had to offer. After several stops, Ivan suggested we could try something a little different. He knew of an area nearby that had once been the estate of Fred Ferber, the inventor of the ballpoint pen. It's unoccupied and overgrown now, but there might be traces of human habitation on the property, which is now part of Wawayanda State Park. Wait: the guy who invented the ballpoint lived in New Jersey? This was a new one on me. We had to check it out. A few twists and turns brought us past a few houses and up an incline to a small, rustic parking lot. Another path the width of a road was off to one side and blocked to traffic by a gate. Old utility poles ran alongside the broad path for as far as I could see from the lot. That was our route to the site of Ferber's house, Ivan told me, toeing the ground in front of us to show me the remnants of macadam that must have been part of the driveway. We walked along the path a bit, musing over whether the utility lines were still in service. Then we came upon a point where they'd fallen to the ground, perhaps in the most recent storm. A little farther along, the lines terminated at a final pole – either that or they were buried underground. Reaching the top of a gentle hill, we found a clearing large enough for a house, but alas, nothing that could be construed as having been part of a dwelling. Ivan saw what looked to be a slab of molded concrete in a ravine below, but on further inspection we determined it was just a large rock. What else could have been here? We saw a parting in a stand of rhododendrons nearby, so that seemed to be just as good a place as any to explore. 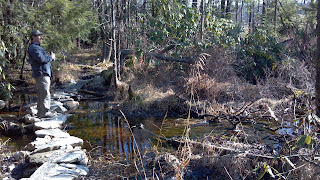 What we found was pretty cool: a little bit of marshy area, fed by small streams that were crossed with stepping stones to ease a hiker's passage. Surely someone had put a lot of thought into this layout. On getting home, I took to the internet to discover more of the story. Ferber emigrated from Austria in 1931, marrying Hedwig, a German immigrant, a few years later. Described by his wife as a dreamer, Ferber bounced from job to job but eventually found success as the inventor of a low-cost ballpoint pen. His Englewood-based Ferber Pen Company earned him a fortune that allowed him to take a run at his ultimate dream: preserving nature in the increasingly urbanizing Northeast corridor. Buying a large expanse in West Milford, he later gave half his land to the state for the creation of Wawayanda State Park. Stories vary on how Fred and Hedwig ended up running an animal sanctuary, but it seems that they started feeding the wildlife, likely attracting more deer, bears and other creatures to the property than normally would have stopped by on their own. According to a 1969 article in Life magazine, Ferber created a non-profit organization called Sussex Woodlands, which bought 3000 acres of land near Bearfort Mountain. National Audubon reportedly endorsed his plans for hiking trails and a conservation center, giving further weight to his presentations to universities and foundations he hoped would buy into his vision. Apparently none did. Two years later, The New York Times reported that Ferber was attempting to sell the property to the state for $1.5 million to cover his back mortgage and property tax payments. Developers had offered him $4 million, but he stood firm on his dream, even when foreclosure and a sheriff’s auction were imminent. The state had insufficient Green Acres funding to purchase the land, but the bank and towns of Vernon and West Milford were reportedly willing to work with the state to ensure the tract’s preservation. 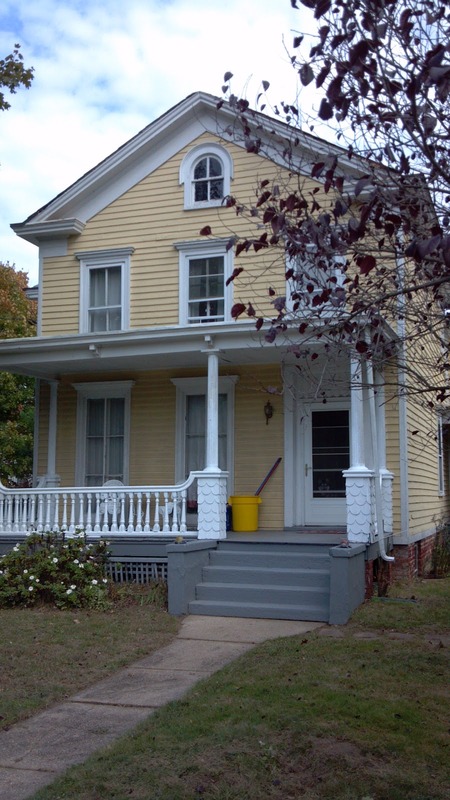 However, a later Times article reports that a group of unnamed Bergen County preservationists stepped forward to pay the back taxes when foreclosure appeared unavoidable. Anyone familiar with land battles, particularly those involving environmentally sensitive areas, can guess that this took quite some time to work out. Eventually the state secured the land, minus 212 acres where the Ferbers continued to live until their deaths in the late 1970s and early 1980s. The most recent development I can find is that a widowed Hedwig was trying to figure out a way to keep their animal sanctuary running after her death. I’m certain there’s a lot more to the story of Fred Ferber. For one thing, after selling his land to the state, he staked a claim to mine gold and silver on the property, though metallurgists confirmed he’d have to process over 6000 tons of local stone to garner one ounce of gold. Why would an environmentalist want to despoil pristine land with a mining operation? And I haven’t seen anything about the fate of the Ferber house itself. Could it be that we didn’t see signs of it because we were looking in the wrong place? Perhaps it’s still standing and occupied somewhere nearby. You have to love a good mystery. One of the things I've always liked about living in old buildings is the possibility that someone noteworthy once lived there. Think about it: any random place might have been where a notable statesman was born, or where an inventor first became intrigued by a great idea. Our Hidden New Jersey travels sometimes unearth these gems, revealing the connection of place and deed with a wayside sign or historical marker. Then there are the places even we would pass without a thought. They're interesting and notable in their own way, but you'd never know it because there's no sign to tell you. The Slack-Carroll House in Dayton is a case in point. Even if we'd driven past it on a birding jaunt, I'd have considered it to be just another a nice-looking old house near a busy intersection. In reality, it represents the once-vanguard of medicine for a small farming village and the civic commitment of two noted physicians. More recently, it's become an evolving symbol of a community's desire to preserve its past and tell its own story. One of our readers, a Dayton resident himself, suggested we check it out. We'll start with the doctors. Born locally in 1840, Clarence Slack attended Philadelphia's Jefferson Medical College during the Civil War and joined the U.S. Navy soon after graduation. He served on the gunboat USS Pembina and later extended his military service as surgeon of the third regiment of the New Jersey National Guard. Following the war, Dr. Slack returned to New Jersey and became the first physician to have an office in Dayton. He conducted his practice from a section of his house, which was the town's first to have indoor plumbing. The Italianate-style home also accommodated a two-bed hospital, accessible through a separate entrance. Dr. Slack took an active interest in his community beyond medicine, serving Middlesex County as a freeholder and county clerk for many years. He also held leadership roles in numerous civic, professional and fraternal groups, including the local Grand Army of the Republic (GAR), the Masons, the Medical Society of New Jersey and the Order of Military Surgeons of New Jersey. It's not clear whether his county government obligations affected his work in Dayton, but Dr. Slack eventually moved to New Brunswick in 1883 and combined forces with his nephew, who was both a physician and a pharmacist. Another doctor took over his Dayton practice briefly before succumbing to cancer, and a third reportedly also had a practice in the village for a brief time. The office and house at 354 Georges Road finally found a new, long-term resident in 1887 when Dr. Slack sold it to fellow Jefferson Medical College alumnus Edward Wallace Carroll. Having started his own practice in Dayton two years earlier, Dr. Carroll was the community's beloved country doctor until his death in 1934. Information on him is scant, but local historians have determined that the Carroll family had an impressive record of service in the medical arena. His three older brothers, all physicians, held high posts during the Civil War, including medical advisor to President Lincoln. Another brother was the official pharmacist in charge of the U.S. Dispensary in Washington, DC. Dr. Carroll himself served several times as Middlesex County Physician, acting as expert witness for the county in court cases. He was also on the staff of St. Peter's Hospital in New Brunswick. Unlike many of the historic places we've visited, the Slack-Carroll house told us none of this story itself. We stopped by on a Sunday afternoon and found the house quiet, with no mention of regular visiting hours on the bulletin board outside the office entrance. The Dayton Village Citizens' Commission is still researching the history of the house, the physicians and the medical care appropriate to their respective eras. As a result, the house is open only for special events, as advertised on the Commission website. 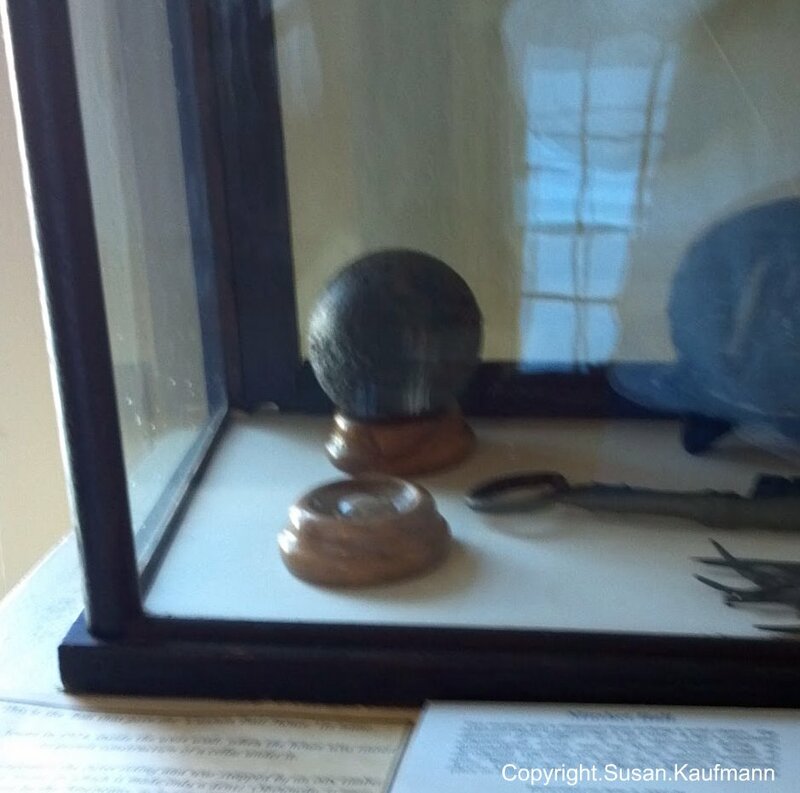 Past exhibits have highlighted the life of a typical country doctor and medical practices during the Civil War. I've mentioned before that I'm a volunteer interpretive guide at Ellis Island, informing visitors about the Public Health Service hospital and medical inspections on the island. 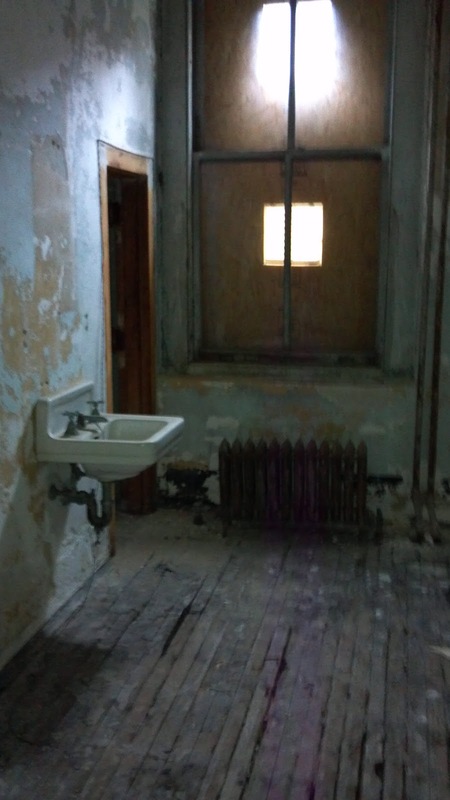 While I spend a fair amount of time at the visitor information desk for the National Park Service, my tours are a function of Save Ellis Island, the non-profit organization that's working to restore the former hospital complex and other buildings on the island. 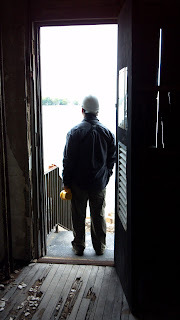 Their progress has been slow, as funding is precious and limited, but SEI has been able to renovate and reopen the island's Ferry Building to house the exhibit focusing on the work of PHS doctors and hospital staff. The hospital buildings themselves sit on the island's south side, unused, unrestored and closed to public visitation. The story of the Ellis Island hospital is relatively unknown, compared to the many tales of passage through the main Immigration Station. Of the 12 million immigrants who passed through Ellis Island, an estimated ten percent were held back for further medical review and/or treatment for diseases that otherwise would prevent their entry into the United States. The treatable were sent to the island's general hospital or to the contagious and infectious disease wards, depending on their condition. Entire buildings were filled with patients suffering from measles, mumps and other contagious but not quarantinable diseases. An army of doctors, nurses, orderlies and attendants kept the whole place running, a virtual city of healing. I've made a handful of visits to the south side buildings to help inform my tours and represent the hospital accurately to visitors who aren't permitted to check out that side of the island. About a month ago, Ivan and I joined another volunteer to check out the infectious and contagious disease hospitals on Island Three, the southernmost portion of Ellis. Most of the furniture is gone, the windows are boarded up and plaster is falling from many of the walls, yet you can still get a sense of the enormity of place. So many lives were changed for the better within these rooms, the destiny of so many families and their descendants were altered forever. We didn't know that day that it would likely be our last visit to the south side for quite some time, if ever. Hurricane Sandy mapped a direct course toward New York Harbor, putting both Ellis and Liberty Islands in peril against powerful storm surges. I worry about what's there, or more fittingly, what isn't there anymore, particularly when it comes to the hospital buildings. According to Park Service sources, Liberty took a pretty heavy hit, and while the Statue and her pedestal stood strong, other buildings on the island are in shambles, as are the island's electrical systems. Ellis Island's main building, the Immigration Museum, fared relatively well, though first floor windows were blown out and several feet of water in the basement knocked out the electrical system. NPS offices in another building were flooded, as was the Ferry Building, but artifacts have been removed and placed into safekeeping. Nothing has been said publicly about the south side or how severely the surges affected that part of the island. There certainly wasn't a lot there to prevent the water from overtaking the seawalls and flooding the already suffering hospital structures. The only visible preventative measures were the stabilization efforts NPS and Save Ellis Island made several years ago. Windows were blocked and vented to mitigate further decay inside, in hopes that funding would be available shortly for a thorough restoration. I doubt that anyone anticipated those measures would suffice in protecting the hospital from a storm of historic proportions. It's safe to say that many of those protective boards were blown away by wind or the surges, allowing the elements to invade the wards and hallways. By my educated guess, it'll be several months before Ellis Island reopens to the public, and that will probably be limited to the Immigration Museum. It's the focal point of the island and it's important that it's up and running as soon as possible. Still, I worry that through lack of funding, the hospital buildings won't receive attention and will decay more rapidly than they had been before. A daunting restoration task will become near impossible, all due to neglect. We can't afford to lose this fundamental portion of America's immigration story. Ultimately only about one percent of all immigrants landing at Ellis Island were refused entry to the US due to medical reasons, a testament to the dedication of the hospital staff. When you consider that about a hundred million Americans can trace their roots to someone who came here through Ellis, the impact of this hospital is enormous. Imagine how many of us wouldn't be here if the sick had simply been turned away. An internet search of "Cannon Ball House" reveals a number of historic houses in America that had the misfortune of being hit by large-caliber ammunition, either during the Revolution or the Civil War. There's even a Cannonball Malt Shop in Gettysburg, a town that probably holds the U.S. record for number of structures marred by embedded ordnance. 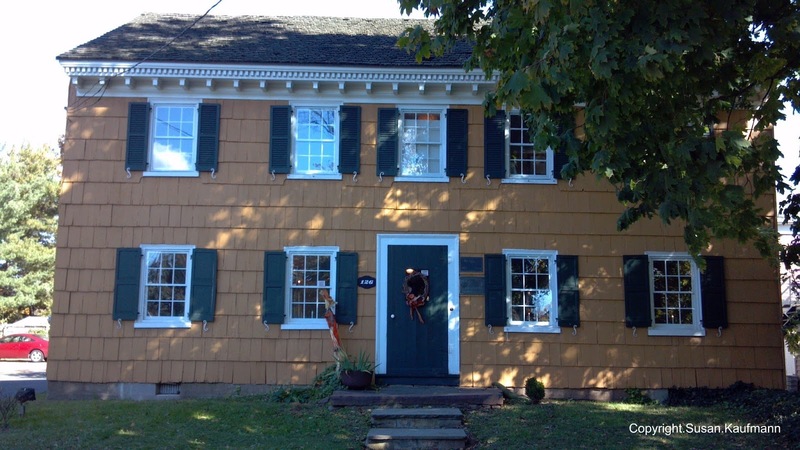 While the concept itself isn't all that rare, Union County is probably unique in New Jersey for having two such houses: the Osborne home in Scotch Plains, which was hit during the 1777 Battle of the Short Hills, and the Springfield Cannon Ball House, struck during the 1780 Battle of Springfield. I’ve passed the Springfield house far too many times without ever stopping to visit. It’s only open for special occasions, so when I heard it was a participating site on Union County’s Four Centuries Weekend, I made it my first stop of the day. Though outmatched and outnumbered, the Americans repulsed the combined British and Hessian troops, and the Battle of Springfield was the last major Revolutionary War battle fought on northern soil. The small village was decimated as the opposing forces burned down the church and all but four homes before they left. It’s theorized that the Cannon Ball House survived only because it was used as a hospital for injured soldiers. The house stayed in private hands for several years, likely no more distinctive than any of the other surviving colonial-era houses. Then, sometime in the 1920s, a previously unknown cannon ball fell out of the western wall, lending its name and provenance to the abode. Since no cannon presumably had been fired in town since 1780, the ball had to have gotten there during the battle, right? Local lore stated that it was of British origin, though common sense would suppose it came from an American cannon, given that the locals were protecting the town from westbound invaders. You might visit the Cannon Ball House to check out the story, but you’ll find much more when you get there. The Springfield Historical Society maintains the property and a range of artifacts to tell the story of the town and notable residents. While I was there, they had an extensive Civil War exhibit featuring Captain Edward Wade, a Springfielder who fought at Antietam and died from wounds suffered in battle. Other exhibits told the story of two brothers who’d grown up in town, one who fought on the Union side and the other for the Confederate. They even had a remarkably well-preserved piece of hardtack. As I mentioned, the Cannon Ball House is open only for occasional special events and by appointment. If you'd like to check it out, contact the Historical Society at 973-376-4784. Deep in the midst of Morris County suburbia, there's a broad swath of land that was once described as "a wooden swamp with a high growth of marsh grass... a natural bird refuge and breeding ground, reported by the Audubon Society to be second only to Cape May in New Jersey as a natural station for birds in seasonal migration." That passage from the 1930's era WPA Guide to New Jersey is still true to some extent. Despite development and encroachment, a lot of Troy Meadows still exists as a haven for a variety of flora and fauna, though the site doesn't show up on a lot of the online birding reports these days. Ivan read a report of vesper sparrows there on Mocosocobirds.com the day before Sandy hit, so off we went. 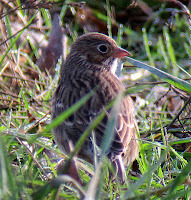 Vesper sparrow at Troy Meadows. Degraded though it may have been by the footprint of human roadways and utility rights of way, Troy Meadows still has a lot to offer. We accessed it via a residential Parsippany street which eventually turned into a rutted dirt road lined with brush and phragmites. The track got muddier and more deeply pocked, to the point where Ivan found a safe opening to pull over, and we took the rest on foot. Walking several hundred feet down the road, we finally got to a broad clearing within a larger field of marsh grass and phrags, allowing us a wide view into the distance. To me it felt as if we'd been transported to the Meadowlands, or maybe to some kind of wetlands version of Kansas wheat fields, with swaying fronds as far as the eye could see. Still, the ground below our feet was carpeted with what looked like tire shreds, dotted with plastic disks and cartridges that had either come from target shooting or fireworks. It's pretty obvious from the scattered beer bottles and wrappers that irresponsible locals capitalize on the relative desolation of the meadows to horse around. The wind was already kicking up a pace by the time we got there, and wildlife was definitely hunkering down to ride out Sandy's lengthy duration. I honestly wasn't feeling all that good about being in an area where a weakened tree could easily be pushed over by a good gust. Perhaps the sparrow would accommodate my concerns and make him/herself visible quickly, without playing the standard avian hide-and-seek with us. Given the slate-gray sky, it was going to be hard to identify field markings of birds on the wing, but as it turned out, it wasn't to be an issue. We'd been there about ten minutes when Ivan spied a sparrow investigating the edge where the rubberized clearing met the reeds. If I didn't know better, I'd believe the bird was cutting us a break by giving us an extended, unobstructed and close view. Sparrows can be frustratingly difficult to differentiate by species, and a birder could reasonably expect that fall migration might bring a dozen or more possibilities. Having the opportunity to actually study the bird in the open was a real gift, because we could check all of the markings that ruled out other species. And, indeed, this very cooperative creature was a vesper sparrow, joined by another for good measure. They were my life vespers, and Ivan's first in a good long while. Mission accomplished, target birds found and cool new birding spot checked out for Hidden New Jersey readers. That was good enough for me. If we were going to be stuck inside for a couple of days while the storm raged, we'd at least be able to savor a very nice find. We're rather accustomed to finding unusual things on our journeys, but I'm still tickled when a random discovery unexpectedly links up with something I'd seen long ago. Most recently, it wasn't just a link: it was a chain. The roots of the story are in a trip I made awhile ago to Constitution Island in the Hudson River. While I was there, I learned that the American forces tried a number of approaches to prevent the British Navy from advancing on strategically-important rivers. For example, not far from Fort Mercer on the Delaware, they modified a French system called chevaux-de-frise. It was conceptually the same as those spikes used in toll lanes and parking garages to prevent drivers from backing up in key areas (you know… the ones that puncture your tires if you go in the wrong direction). American General Robert Erskine devised a nautical version that, once sunk across the river, would wreak havoc on the hulls of any ships that dared to cross. While these spikes were used in the Hudson, the Americans added another blocking mechanism for good measure. 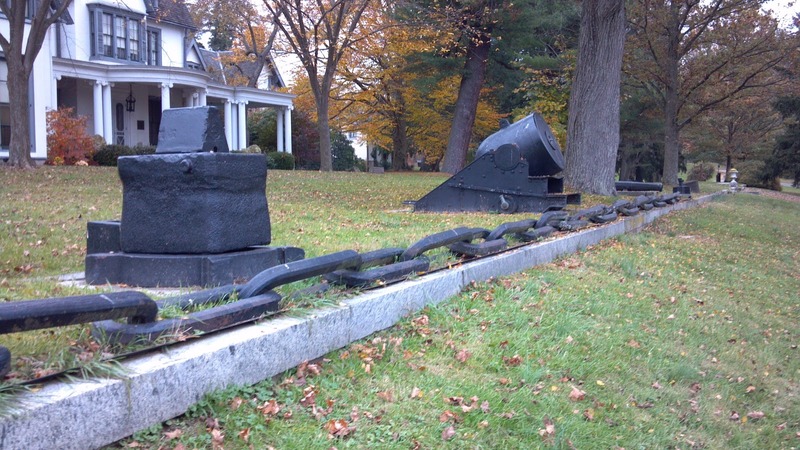 Fearing that the British would attempt to sail upriver from their stronghold in Manhattan, they placed a massive chain across the river between West Point and Constitution Island. That portion of the river was already difficult to navigate by ship, and the theory was that slowing traffic even further would provide additional time for the Americans to fire on their opponents from the elevated West Point vantage. From 1778 to 1782, the chain was set out in the spring to block passage, and then removed in the fall to prevent damage from ice in the winter. Ultimately, the British never tried to get past the chain, though Benedict Arnold reportedly had claimed it could be breached. Some of the massive links were saved, though others were melted down for salvage. I saw a bunch during my visit to Constitution Island, where the anchor point and a short length are preserved near the dock. What does this have to do with New Jersey? Consider that Washington and his military leadership relied on the state’s significant iron mines and forges for weapons and ammunition, earning the state the sobriquet of Arsenal of the Revolution. The chain had to be made somewhere, and it only made sense that it came from here. Thing is, while I was fairly certain of that, I wasn’t sure exactly where it was made or where it ended up. Someone had told Ivan that a length of the chain was being used as a decorative border in front of a building near the Wayne/Paterson border, but when we checked it out, I saw that the links were very different from those I'd seen near the Hudson. A pre-hurricane visit to Ringwood Manor helped to solve the mystery. The Manor, of course, was home to General Erskine, Washington’s chief geographer and surveyor during the war, as well as the operator of the Long Pond Ironworks. His mansion is fronted by several impressive examples of American military history, including the cannon used on the main deck of the U.S.S. Constitution during the War of 1812, and a mortar used during the Civil War. They're both lined up against a massive 25-link length of chain and an anvil. No markers are there to explain the significance of the ironwork, and if you didn’t know better, you’d probably write off the chain as a coarse border or maybe a length that had once tethered an anchor to a ship. I immediately had my suspicions about its provenance, and a bit of research proved it out: it's part of the Hudson chain, come to rest where it was manufactured. Thing is, when I looked into the history of the Hudson chain a little more deeply, it seems to have many fathers and many origins. Some will tell you that the entire chain was fabricated in New York State, while others will state that various lengths were made in different places and then assembled near West Point. I've also found a reputable source that asserts that the entire thing was made at Erskine's iron works. What's the real story? I think you know where I stand on the issue, and I'm pretty confident I'm right. I'm not a metallurgist or an expert on 18th century ironworks, but to me, the Ringwood Manor chain looks a heck of a lot like the Constitution Island chain. Originally, when I planned our first November story, I intended to write a brief entry about the travels Ivan and I made in the two days before Hurricane Sandy made landfall in southern New Jersey. We made the most of our time on Saturday and Sunday, driving around Sussex and Morris Counties and making a few really neat discoveries before settling in to ride out the storm. Today, however, it doesn't seem very appropriate to be sharing those adventures when so many of our fellow New Jerseyans have lost so much. We're fortunate to have only been without power and heat for a few days, a mere inconvenience by comparison. The devastation the hurricane wrought is beyond description; I'm sure you've seen as much or more of the coverage than I have, and you likely don't need me to tell you. Some of you may have experienced it first hand. Situations like this remind me of certain truths in life. When it comes to Mother Nature, there's very little we can do but adapt and ride out the challenges. We have to admit we have less control over our circumstances than we'd like to admit, as difficult as it is to accept. And adversity gives us opportunity to show our better natures. So many people and communities have been changed dramatically by the storm's impact. The fury of wind-driven waves has reshaped our coast, taking away homes and businesses and memories as other historic weather events have claimed parts of Cape May and the barrier islands in the past. The simple yet incomprehensible fact is that many of the things we remember so dearly about Southern New Jersey aren't just hidden. They're gone. It will take some time for the damage to be assessed fully, and it'll take a while for next steps to be planned out and taken. In the meantime, we have the opportunity to be truly kind to each other. Whether it's volunteering to help out those in need, contributing to the economies of the affected communities, or simply by cutting each other a break by not getting frustrated and angry on a long line for gas, it's us New Jerseyans who control whether the storm's aftermath gets the best of us. Our neighbors and friends need us. We know we're great people. Now's the time to show it.